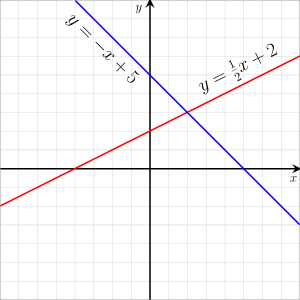 The linear equations of y=-x+5 and y=.5x+2. The x's are variables. where : m = the rate of change, or slope. The slope is how fast the line moves up or down. Larger numbers will make the slope steeper. If m is a negative number, then the line will appear to fall or go down the page when read from left to right. If m is a positive number, then the line will appear to climb the page when read from left to right. b = the y-intercept of the function. This is where the function crosses the y - axis of the coordinate plane.The first equation is called slope-intercept form, because in it, the slope (m) and y-intercept (b) are easily found.The second equation is called point-slope form, because in it, a point on the graph (x1, y1) and the slope (m) are easily found. This page was last changed on 26 November 2017, at 21:41.